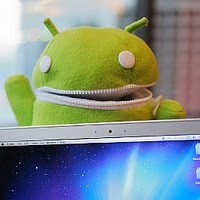 The fact that the world is coming closer is accepted my all the netizens today. Now its time to accept the fact that, even Good Food is coming near you. 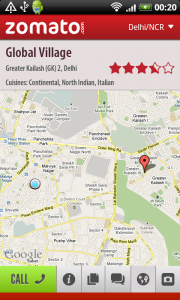 I am talking about the Zomato Android App which helps you search for the best restaurent in your vicinity by considering your location. 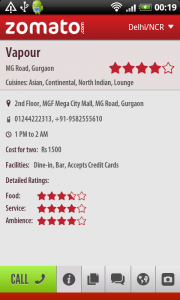 This Android App is very user friendly and gives out all the major details about the restaurants which you may need including Contact details of that place, Menu cards, User Reviews, Photos of the Actual Place, Facilities Available, Average cost for 2 people, Timings, Ratings (individually on the basis of Food Quality, Service and Ambience) and Exact Address of the Place. You can also search for any particular restaurant to find more about it or also find some restaurant at a distant place where you wish to go! 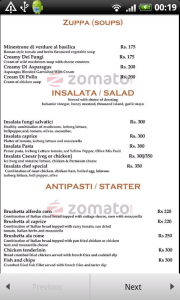 The best part about this Zomato App is that you can call the Place directly from within the application so you don’t need to copy the Restaurant contact number anywhere. Also, it lets you know if any discount coupons available for restaurants. This application is currently free and lists nearly all the restaurants in 5 Indian Cities namely Delhi NCR, Mumbai, Bangalore, Kolkata and Pune.